Dive Journal: The mid-morning dive today is at Shark Point, and Johnny joins us for this one. On our descent, John again had some trouble clearing his ears, but I really like the way he calmly works his way through that. It is a fine dive with many of the usual critters and scenes. A gorgeous tiger grouper, a little darker than usual, is lurking around with a bright red mouth. There is also lots of cleaning going on, especially the parrotfish and doctorfish. Down over the wall we discover a great cleaning station for creole wrasses. Long streaming schools come flying downhill over the reef, then one by one abruptly stop at the station in a vertical position for maybe 3 to 5 seconds, hovering above the floor. The collection of brilliant blue-violet fish is a nice scene, and the constant changing of bodies is a lot of fun to watch. I also really enjoy a flurry of doctorfish in all shades ranging from pale to midnight blue. 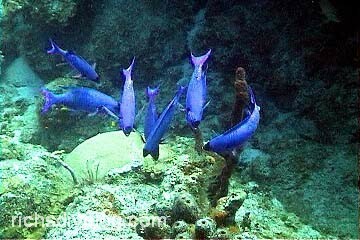 The school may well have included blue tangs or ocean surgeonfish as well – difficult to tell for sure. This pack vigorously grazes on algae, quickly shifting from one spot to the next. I also spot a mutton snapper this dive, another new one for me, although a pretty drab-looking fish. At the dive end, I catch sight of a stingray who circles around me, then takes off in a straight line angled away from the boat. As I watch him fade into the blue, I am really astounded at the speed he attains – screaming over the sandy floor.